B. Yüksel, Secchi, C., Bülthoff, H. H., and Franchi, A., “Aerial Physical Interaction via IDA-PBC}”, The International Journal of Robotics Research, In Press. A. Franchi, Robuffo Giordano, P., and Michieletto, G., “Online Leader Selection for Improved Collective Tracking and Formation Control: the Second Order Case”, IEEE Transactions on Control of Network Systems, In Press. Y. Sarkisov, Kim, M. J., Bicego, D., Tsetserukou, D., Ott, C., Franchi, A., and Kondak, K., “Development of SAM: cable-Suspended Aerial Manipulator”, in 2019 IEEE Int. Conf. on Robotics and Automation, Montreal, Canada, 2019. M. Tognon, Chávez, H. A. Tello, Gasparin, E., Sablé, Q., Bicego, D., Mallet, A., Lany, M., Santi, G., Revaz, B., Cortés, J., and Franchi, A., “A Truly Redundant Aerial Manipulator System with Application to Push-And-Slide Inspection in Industrial Plants”, IEEE Robotics and Automation Letters, vol. 4, no. 2, pp. 1846-1851, 2019. G. Antonelli, Cataldi, E., Arrichiello, F., Robuffo Giordano, P., Chiaverini, S., and Franchi, A., “Adaptive Trajectory Tracking for Quadrotor MAVs in Presence of Parameter Uncertainties and External Disturbances”, IEEE Trans. on Control Systems Technology, vol. 26, no. 1, pp. 248–254, 2018. M. Tognon, Gabellieri, C., Pallottino, L., and Franchi, A., “Aerial Co-Manipulation with Cables: The Role of Internal Force for Equilibria, Stability, and Passivity”, IEEE Robotics and Automation Letters, Special Issue on Aerial Manipulation, vol. 3, no. 3, pp. 2577-2583, 2018. A. Ollero, Heredia, G., Franchi, A., Antonelli, G., Kondak, K., Sanfeliu, A., Viguria, A., de Dios, J. R. Martine, Pierri, F., Cortés, J., Santamaria-Navarro, A., Trujillo, M. A., Balachandran, R., Andrade-Cetto, J., and Rodriguez, A., “The AEROARMS Project: Aerial Robots with Advanced Manipulation Capabilities for Inspection and Maintenance”, IEEE Robotics and Automation Magazine, Special Issue on Floating-base (Aerial and Underwater) Manipulation, vol. 25, no. 4, pp. 12-23, 2018. M. Tognon, Cataldi, E., Tello Chavez, H., Antonelli, G., Cortés, J., and Franchi, A., “Control-Aware Motion Planning for Task-Constrained Aerial Manipulation”, IEEE Robotics and Automation Letters, Special Issue on Aerial Manipulation, vol. 3, no. 3, pp. 2478-2484, 2018. M. Furci, Bicego, D., and Franchi, A., “Design and Input Allocation for Robots with Saturated Inputs via Genetic Algorithms”, in 12th IFAC Symposium on Robot Control, Budapest, Hungary, 2018. M. Faessler, Franchi, A., and Scaramuzza, D., “Differential Flatness of Quadrotor Dynamics Subject to Rotor Drag for Accurate Tracking of High-Speed Trajectories”, IEEE Robotics and Automation Letters, vol. 3, no. 2, pp. 620-626, 2018. A. Franchi, Petitti, A., and Rizzo, A., “Distributed Estimation of State and Parameters in Multi-Agent Cooperative Manipulation”, IEEE Trans. on Control of Network Systems, 2018. F. Morbidi, Bicego, D., Ryll, M., and Franchi, A., “Energy-Efficient Trajectory Generation for a Hexarotor with Dual-Tilting Propellers”, in 2018 IEEE/RSJ Int. Conf. on Intelligent Robots and Systems, Madrid, Spain, 2018. V. Walter, Saska, M., and Franchi, A., “Fast Mutual Relative Localization of UAVs using Ultraviolet LED markers”, in 2018 International Conference on Unmanned Aircraft Systems, Dallas, TX, 2018, pp. 1217-1226. A. Franchi, Carli, R., Bicego, D., and Ryll, M., “Full-Pose Tracking Control for Aerial Robotic Systems with Laterally-Bounded Input Force”, IEEE Trans. on Robotics, vol. 34, no. 2, pp. 534-541, 2018. G. Michieletto, Ryll, M., and Franchi, A., “Fundamental Actuation Properties of Multi-rotors: Force-Moment Decoupling and Fail-safe Robustness”, IEEE Trans. on Robotics, vol. 34, no. 3, 2018. V. Arellano-Quintana, Merchan-Cruz, E., and Franchi, A., “A Novel Experimental Model and a Drag-optimal Allocation Method for Variable-Pitch Propellers in Multirotors”, IEEE Access, vol. 6, pp. 68155-68168, 2018. M. Tognon and Franchi, A., “Omnidirectional Aerial Vehicles with Unidirectional Thrusters: Theory, Optimal Design, and Control”, IEEE Robotics and Automation Letters, vol. 3, no. 3, pp. 2277-2282, 2018. A. Franchi and Robuffo Giordano, P., “Online Leader Selection for Improved Collective Tracking and Formation Maintenance”, IEEE Trans. on Control of Network Systems, vol. 5, no. 1, pp. 3-13, 2018. C. Masone, Mohammadi, M., Robuffo Giordano, P., and Franchi, A., “Shared Planning and Control for Mobile Robots with Integral Haptic Feedback”, The International Journal of Robotics Research, vol. 37, no. 11, pp. 1395-1420, 2018. C. Gabellieri, Tognon, M., Palottino, L., and Franchi, A., “A Study on Force-based Collaboration in Flying Swarms”, in 11th Int. Conf. on Swarm Intelligence ANTS 2018, Rome, Italy, 2018. 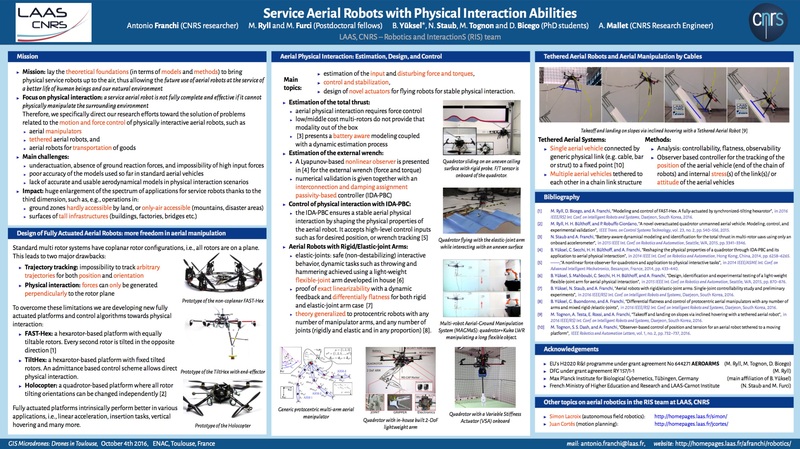 Q. Delamare, Robuffo Giordano, P., and Franchi, A., “Towards Aerial Physical Locomotion: the Contact-Fly-Contact Problem”, IEEE Robotics and Automation Letters, Special Issue on Aerial Manipulation, vol. 3, pp. 1514-1521, 2018. P. Robuffo Giordano, Delamare, Q., and Franchi, A., “Trajectory Generation for Minimum Closed-Loop State Sensitivity”, in 2018 IEEE Int. Conf. on Robotics and Automation, Brisbane, Australia, 2018, pp. 286-293. M. Ryll, Bicego, D., and Franchi, A., “A Truly Redundant Aerial Manipulator exploiting a Multi-directional Thrust Base”, in 12th IFAC Symposium on Robot Control, Budapest, Hungary, 2018. M. Ryll, Muscio, G., Pierri, F., Cataldi, E., Antonelli, G., Caccavale, F., and Franchi, A., “6D Physical Interaction with a Fully Actuated Aerial Robot”, in 2017 IEEE Int. Conf. on Robotics and Automation, Singapore, 2017, pp. 5190-5195. A. Franchi and Mallet, A., “Adaptive Closed-loop Speed Control of BLDC Motors with Applications to Multi-rotor Aerial Vehicles”, in 2017 IEEE Int. Conf. on Robotics and Automation, Singapore, 2017. G. Michieletto, Ryll, M., and Franchi, A., “Control of Statically Hoverable Multi-Rotor Aerial Vehicles and Application to Rotor-Failure Robustness for Hexarotors”, in 2017 IEEE Int. Conf. on Robotics and Automation, Singapore, 2017. T. Nestmeyer, Robuffo Giordano, P., Bülthoff, H. H., and Franchi, A., “Decentralized Simultaneous Multi-target Exploration using a Connected Network of Multiple Robots”, Autonomous Robots, vol. 41, no. 4, pp. 989-1011, 2017. M. Tognon, Yüksel, B., Buondonno, G., and Franchi, A., “Dynamic Decentralized Control for Protocentric Aerial Manipulators”, in 2017 IEEE Int. Conf. on Robotics and Automation, Singapore, 2017, pp. 6375-6380. M. Tognon and Franchi, A., “Dynamics, Control, and Estimation for Aerial Robots Tethered by Cables or Bars”, IEEE Transaction on Robotics, vol. 33, no. 4, pp. 834-845, 2017. C. Nainer, Furci, M., Seuret, A., Zaccarian, L., and Franchi, A., “Hierarchical Control of the Over-Actuated ROSPO Platform via Static Input Allocation”, in 20th IFAC World Congress, Toulouse, France, 2017. A. Franchi, “Human-Collaborative Schemes in the Motion Control of Single and Multiple Mobile Robots”, in Trends in Control and Decision-Making for Human-Robot Collaboration Systems, Springer, 2017, pp. 301-324. M. Tognon and Franchi, A., “Landing and take-off on/from sloped and non-planar surfaces with more than 50 degrees of inclination”, in 2017 International Micro Air Vehicle Conference, Toulouse, France, 2017, pp. 97-102. Y. Solana, Furci, M., Cortés, J., and Franchi, A., “Multi-Robot Path Planning with Maintenance of Generalized Connectivity”, in The 1st Int. Symp. on Multi-Robot and Multi-Agent Systems, Los Angeles, CA, 2017. G. Michieletto, Cenedese, A., Zaccarian, L., and Franchi, A., “Nonlinear Control of Multi-Rotor Aerial Vehicles Based on the Zero-Moment Direction”, in 20th IFAC World Congress, Toulouse, France, 2017. M. Tognon and Franchi, A., “Position Tracking Control for an Aerial Robot Passively Tethered to an Independently Moving Platform”, in 20th IFAC World Congress, Toulouse, France, 2017. J. - L. - L. Sanchez-Lopez, Arellano-Quintana, V., Tognon, M., Campoy, P., and Franchi, A., “Visual Marker based Multi-Sensor Fusion State Estimation”, in 20th IFAC World Congress, Toulouse, France, 2017. S. Spedicato, Notarstefano, G., Bülthoff, H. H., and Franchi, A., “Aggressive Maneuver Regulation of a Quadrotor UAV”, in Robotics Research, The 16th International Symposium ISRR, vol. 114, Springer, 2016, pp. 95-112. G. Michieletto, Cenedese, A., and Franchi, A., “Bearing Rigidity Theory in SE(3)”, in 55th IEEE Conference on Decision and Control, Las Vegas, NV, 2016, pp. 5950-5955. M. Mohammadi, Franchi, A., Barcelli, D., and Prattichizzo, D., “Cooperative Aerial Tele-Manipulation with Haptic Feedback”, in 2016 IEEE/RSJ Int. Conf. on Intelligent Robots and System, Daejeon, South Korea, 2016, pp. 5092-5098. A. Petitti, Franchi, A., Di Paola, D., and Rizzo, A., “Decentralized Motion Control for Cooperative Manipulation with a Team of Networked Mobile Manipulators”, in 2016 IEEE Int. Conf. on Robotics and Automation, Stockholm, Sweden, 2016, pp. 441-446. A. Franchi, Stegagno, P., and Oriolo, G., “Decentralized Multi-Robot Encirclement of a 3D Target with Guaranteed Collision Avoidance”, Autonomous Robots, vol. 40, no. 2, pp. 245-265, 2016. B. Yüksel, Buondonno, G., and Franchi, A., “Differential Flatness and Control of Protocentric Aerial Manipulators with Any Number of Arms and Mixed Rigid-/Elastic-Joints”, in 2016 IEEE/RSJ Int. Conf. on Intelligent Robots and System, Daejeon, South Korea, 2016, pp. 561-566. S. Spedicato, Franchi, A., and Notarstefano, G., “From Tracking to Robust Maneuver Regulation: an Easy-to-Design Approach for VTOL Aerial Robots”, in 2016 IEEE Int. Conf. on Robotics and Automation, Stockholm, Sweden, 2016, pp. 2965-2970. P. Stegagno, Cognetti, M., Oriolo, G., Bülthoff, H. H., and Franchi, A., “Ground and Aerial Mutual Localization using Anonymous Relative-Bearing Measurements”, IEEE Transaction on Robotics, vol. 32, no. 5, pp. 1133-1151, 2016. M. Ryll, Bicego, D., and Franchi, A., “Modeling and Control of FAST-Hex: a Fully-Actuated by Synchronized-Tilting Hexarotor”, in 2016 IEEE/RSJ Int. Conf. on Intelligent Robots and System, Daejeon, South Korea, 2016, pp. 1689-1694. A. Carron, Todescato, M., Carli, R., Franchi, A., and Schenato, L., “Multi-Robot Localization via GPS and Relative Measurements in the Presence of Asynchronous and Lossy Communication”, in 15th European Control Conference, Aalborg, Denmark, 2016. M. Tognon, Dash, S. S., and Franchi, A., “Observer-based Control of Position and Tension for an Aerial Robot Tethered to a Moving Platform”, IEEE Robotics and Automation Letters, vol. 1, no. 2, pp. 732-737, 2016. F. Schiano, Franchi, A., Zelazo, D., and Robuffo Giordano, P., “A Rigidity-Based Decentralized Bearing Formation Controller for Groups of Quadrotor UAVs”, in 2016 IEEE/RSJ Int. Conf. on Intelligent Robots and System, Daejeon, South Korea, 2016, pp. 5099-5106. M. Tognon, Testa, A., Rossi, E., and Franchi, A., “Takeoff and Landing on Slopes via Inclined Hovering with a Tethered Aerial Robot”, in 2016 IEEE/RSJ Int. Conf. on Intelligent Robots and Systems, Daejeon, South Korea, 2016, pp. 1702-1707. D. Zelazo, Robuffo Giordano, P., and Franchi, A., “Bearing-Only Formation Control Using an SE(2) Rigidity Theory”, in 54rd IEEE Conference on Decision and Control, Osaka, Japan, 2015, pp. 6121-6126. M. Tognon and Franchi, A., “Control of Motion and Internal Stresses for a Chain of Two Underactuated Aerial Robots”, in 14th European Control Conference, Linz, Austria, 2015, pp. 1620-1625. A. Franchi, Petitti, A., and Rizzo, A., “Decentralized Parameter Estimation and Observation for Cooperative Mobile Manipulation of an Unknown Load using Noisy Measurements”, in 2015 IEEE Int. Conf. on Robotics and Automation, Seattle, WA, 2015, pp. 5517-5522. B. Yüksel, Mahboubi, S., Secchi, C., Bülthoff, H. H., and Franchi, A., “Design, Identification and Experimental Testing of a Light-Weight Flexible-joint Arm for Aerial Physical Interaction”, in 2015 IEEE Int. Conf. on Robotics and Automation, Seattle, WA, 2015, pp. 870-876. G. Gioioso, Mohammadi, M., Franchi, A., and Prattichizzo, D., “A Force-based Bilateral Teleoperation Framework for Aerial Robots in Contact with the Environment”, in 2015 IEEE Int. Conf. on Robotics and Automation, Seattle, WA, 2015, pp. 318-324. S. Rajappa, Ryll, M., Bülthoff, H. H., and Franchi, A., “Modeling, Control and Design Optimization for a Fully-actuated Hexarotor Aerial Vehicle with Tilted Propellers”, in 2015 IEEE Int. Conf. on Robotics and Automation, Seattle, WA, 2015, pp. 4006-4013. M. Tognon and Franchi, A., “Nonlinear Observer for the Control of Bi-Tethered Multi Aerial Robots”, in 2015 IEEE/RSJ Int. Conf. on Intelligent Robots and Systems, Hamburg, Germany, 2015, pp. 1852-1857. M. Tognon and Franchi, A., “Nonlinear Observer-based Tracking Control of Link Stress and Elevation for a Tethered Aerial Robot using Inertial-only Measurements”, in 2015 IEEE Int. Conf. on Robotics and Automation, Seattle, WA, 2015, pp. 3994-3999. D. Zelazo, Franchi, A., Bülthoff, H. H., and Robuffo Giordano, P., “Decentralized Rigidity Maintenance Control with Range Measurements for Multi-Robot Systems”, The International Journal of Robotics Research, vol. 34, no. 1, pp. 105-128, 2014. A. Franchi, Petitti, A., and Rizzo, A., “Distributed Estimation of the Inertial Parameters of an Unknown Load via Multi-Robot Manipulation”, in 53rd IEEE Conference on Decision and Control, Los Angeles, CA, 2014, pp. 6111-6116. G. Gioioso, Franchi, A., Salvietti, G., Scheggi, S., and Prattichizzo, D., “The Flying Hand: a Formation of UAVs for Cooperative Aerial Tele-Manipulation”, in 2014 IEEE Int. Conf. on Robotics and Automation, Hong Kong, China, 2014, pp. 4335-4341. G. Gioioso, Salvietti, G., Franchi, A., Malvezzi, M., Scheggi, S., Meli, L., Ryll, M., Bülthoff, H. H., and Prattichizzo, D., “The Flying Hand: a Teleoperation Framework for Cooperative Aerial Grasping and Transportation”, Automatica.it 2014, Convegno Annuale dei Docenti e Ricercatori Italiani in Automatica. Bergamo, Italy, 2014. M. Gagliardi, Oriolo, G., Bülthoff, H. H., and Franchi, A., “Image-based Road Network Clearing without Localization and without Maps using a Team of UAVs”, in 2014 European Control Conference, Strasbourg, France, 2014, pp. 1902-1908. P. Tokekar, Isler, V., and Franchi, A., “Multi-Target Visual Tracking with UAVs”, in 2014 IEEE/RSJ Int. Conf. on Intelligent Robots and Systems, Chicago, IL, 2014, pp. 656-661. B. Yüksel, Secchi, C., Bülthoff, H. H., and Franchi, A., “A Nonlinear Force Observer for Quadrotors and Application to Physical Interactive Tasks”, in IEEE/ASME International Conference on Advanced Intelligent Mechatronics, Besançon, France, 2014, pp. 433-440. B. Yüksel, Secchi, C., Bülthoff, H. H., and Franchi, A., “Reshaping the Physical Properties of a Quadrotor through IDA-PBC and its Application to Aerial Physical Interaction”, in 2014 IEEE Int. Conf. on Robotics and Automation, Hong Kong, China, 2014, pp. 6258-6265. D. Zelazo, Franchi, A., and Robuffo Giordano, P., “Rigidity Theory in SE(2) for Unscaled Relative Position Estimation using only Bearing”, in 2014 European Control Conference, Strasbourg, France, 2014, pp. 2703-2708. C. Masone, Robuffo Giordano, P., Bülthoff, H. H., and Franchi, A., “Semi-autonomous Trajectory Generation for Mobile Robots with Integral Haptic Shared Control”, in 2014 IEEE Int. Conf. on Robotics and Automation, Hong Kong, China, 2014, pp. 6468-6475. P. Stegagno, Basile, M., Bülthoff, H. H., and Franchi, A., “A Semi-autonomous UAV Platform for Indoor Remote Operation with Visual and Haptic Feedback”, in 2014 IEEE Int. Conf. on Robotics and Automation, Hong Kong, China, 2014, pp. 3862-3869. G. Gioioso, Ryll, M., Prattichizzo, D., Bülthoff, H. H., and Franchi, A., “Turning a Near-hovering Controlled Quadrotor into a 3D Force Effector”, in 2014 IEEE Int. Conf. on Robotics and Automation, Hong Kong, China, 2014, pp. 6278-6284. C. Secchi, Franchi, A., Bülthoff, H. H., and Robuffo Giordano, P., “Bilateral Control of the Degree of Connectivity in Multiple Mobile-robot Teleoperation”, in 2013 IEEE Int. Conf. on Robotics and Automation, Karlsruhe, Germany, 2013. G. Antonelli, Cataldi, E., Robuffo Giordano, P., Chiaverini, S., and Franchi, A., “Experimental Validation of a New Adaptive Control for Quadrotors”, in 2013 IEEE/RSJ Int. Conf. on Intelligent Robots and Systems, Tokyo, Japan, 2013. G. Gioioso, Franchi, A., Salvietti, G., Scheggi, S., and Prattichizzo, D., “Hand Driven UAV Formation for Cooperative Grasping and Transportation: the Flying Hand”, RSS 2013 Work. on Aerial Mobile Manipulation. Berlin, Germany, 2013. T. Nestmeyer, Robuffo Giordano, P., and Franchi, A., “Human-assisted Parallel Multi-target Visiting in a Connected Topology”, 6th Int. Work. on Human-Friendly Robotics. Rome, Italy, 2013. H. I. Son, Franchi, A., Chuang, L. L., Kim, J., Bülthoff, H. H., and Robuffo Giordano, P., “Human-Centered Design and Evaluation of Haptic Cueing for Teleoperation of Multiple Mobile Robots”, IEEE Transactions on Systems, Man, & Cybernetics. Part B: Cybernetics, vol. 43, no. 2, pp. 597-609, 2013. T. Nestmeyer, Riedel, M., Lächele, J., Hartmann, S., Botschen, F., Robuffo Giordano, P., and Franchi, A., “Interactive Demo: Haptic Remote Control of Multiple UAVs with Autonomous Cohesive Behavior”, Int. Work. on Towards Fully Decentralized Multi-Robot Systems: Hardware, Software and Integration, at 2013 IEEE Int. Conf. on Robotics and Automation. Karlsruhe, Germany, 2013. T. Nestmeyer, Robuffo Giordano, P., and Franchi, A., “Multi-target Simultaneous Exploration with Continual Connectivity”, 2th Int. Work. on Crossing the Reality Gap - From Single to Multi- to Many Robot Systems, at 2013 IEEE Int. Conf. on Robotics and Automation. Karlsruhe, Germany, 2013. A. Franchi, Oriolo, G., and Stegagno, P., “Mutual Localization in Multi-Robot Systems using Anonymous Relative Measurements”, The International Journal of Robotics Research, vol. 32, no. 11, pp. 1303-1322, 2013. R. Spica, Robuffo Giordano, P., Ryll, M., Bülthoff, H. H., and Franchi, A., “An Open-Source Hardware/Software Architecture for Quadrotor UAVs”, in 2nd IFAC Workshop on Research, Education and Development of Unmanned Aerial Systems, Compiegne, France, 2013. P. Robuffo Giordano, Franchi, A., Secchi, C., and Bülthoff, H. H., “A Passivity-Based Decentralized Strategy for Generalized Connectivity Maintenance”, The International Journal of Robotics Research, vol. 32, no. 3, pp. 299-323, 2013. P. Stegagno, Basile, M., Bülthoff, H. H., and Franchi, A., “RGB-D based Haptic Teleoperation of UAVs with Onboard Sensors: Development and Preliminary Results”, in 2013 IROS Work. on Vision-based Closed-Loop Control and Navigation of Micro Helicopters in GPS-denied Environments, Tokyo, Japan, 2013. D. Lee, Franchi, A., Son, H. I., Bülthoff, H. H., and Robuffo Giordano, P., “Semi-Autonomous Haptic Teleoperation Control Architecture of Multiple Unmanned Aerial Vehicles”, IEEE/ASME Transaction on Mechatronics, Focused Section on Aerospace Mechatronics, vol. 18, no. 4, pp. 1334-1345, 2013. A. Censi, Franchi, A., Marchionni, L., and Oriolo, G., “Simultaneous Calibration of Odometry and Sensor Parameters for Mobile Robots”, IEEE Transaction on Robotics, vol. 29, no. 2, pp. 475-492, 2013. J. Lächele, Riedel, M., Robuffo Giordano, P., and Franchi, A., “SwarmSimX and TeleKyb: Two ROS-integrated Software Frameworks for Single- and Multi-Robot Applications”, Int. Work. on Towards Fully Decentralized Multi-Robot Systems: Hardware, Software and Integration, at 2013 IEEE Int. Conf. on Robotics and Automation. Karlsruhe, Germany, 2013. V. Grabe, Riedel, M., Bülthoff, H. H., Robuffo Giordano, P., and Franchi, A., “The TeleKyb Framework for a Modular and Extendible ROS-based Quadrotor Control”, in 6th European Conference on Mobile Robots, Barcelona, Spain, 2013. A. Franchi, “Towards Autonomous-collaborative and Haptic-tele-operated UAVs with Fully-onboard State Estimation and Physical Interaction Capabilities”, in 2013 IROS Work. on From Remotely-Controlled to Autonomous-Collaborative Robots, Tokyo, Japan, 2013. P. Stegagno, Basile, M., Bülthoff, H. H., and Franchi, A., “Vision-based Autonomous Control of a Quadrotor UAV using an Onboard RGB-D Camera and its Application to Haptic Teleoperation”, in 2nd IFAC Workshop on Research, Education and Development of Unmanned Aerial Systems, Compiegne, France, 2013. M. Cognetti, Stegagno, P., Franchi, A., Oriolo, G., and Bülthoff, H. H., “3D Mutual Localization with Anonymous Bearing Measurements”, in 2012 IEEE Int. Conf. on Robotics and Automation, St. Paul, MN, 2012. R. Spica, Franchi, A., Oriolo, G., Bülthoff, H. H., and Robuffo Giordano, P., “Aerial Grasping of a Moving Target with a Quadrotor UAV”, in 2012 IEEE/RSJ Int. Conf. on Intelligent Robots and Systems, Vilamoura, Portugal, 2012, pp. 4985-4992. C. Secchi, Franchi, A., Bülthoff, H. H., and Robuffo Giordano, P., “Bilateral Teleoperation of a Group of UAVs with Communication Delays and Switching Topology”, in 2012 IEEE Int. Conf. on Robotics and Automation, St. Paul, MN, 2012. A. Franchi, Secchi, C., Son, H. I., Bülthoff, H. H., and Robuffo Giordano, P., “Bilateral Teleoperation of Groups of Mobile Robots with Time-Varying Topology”, IEEE Transaction on Robotics, vol. 28, no. 5, pp. 1019	-1033, 2012. F. Pasqualetti, Franchi, A., and Bullo, F., “On Cooperative Patrolling: Optimal Trajectories, Complexity Analysis, and Approximation Algorithms”, IEEE Transaction on Robotics, vol. 28, no. 3, pp. 592-606, 2012. A. Franchi and Robuffo Giordano, P., “Decentralized Control of Parallel Rigid Formations with Direction Constraints and Bearing Measurements”, in 51th IEEE Conference on Decision and Control , Maui, HI, 2012, pp. 5310-5317. J. W. Durham, Franchi, A., and Bullo, F., “Distributed Pursuit-Evasion without Mapping or Global Localization via Local Frontiers”, Autonomous Robots, vol. 32, no. 1, pp. 81-95, 2012. M. Riedel, Franchi, A., Bülthoff, H. H., Robuffo Giordano, P., and Son, H. I., “Experiments on Intercontinental Haptic Control of Multiple UAVs”, in 12th Int. Conf. on Intelligent Autonomous Systems, Jeju Island, Korea, 2012, pp. 227-238. C. Masone, Franchi, A., Bülthoff, H. H., and Robuffo Giordano, P., “Interactive Planning of Persistent Trajectories for Human-Assisted Navigation of Mobile Robots”, in 2012 IEEE/RSJ Int. Conf. on Intelligent Robots and Systems, Vilamoura, Portugal, 2012, pp. 2641-2648. M. Riedel, Bülthoff, H. H., Franchi, A., and Robuffo Giordano, P., “Intercontinental Haptic Control and Advanced Supervisory Interfaces for Groups of Multiple UAVs”, 5th Int. Work. on Human-Friendly Robotics. Bruxelles, Belgium, 2012. A. Franchi, Masone, C., Grabe, V., Ryll, M., Bülthoff, H. H., and Robuffo Giordano, P., “Modeling and Control of UAV Bearing-Formations with Bilateral High-Level Steering”, The International Journal of Robotics Research, Special Issue on 3D Exploration, Mapping, and Surveillance, vol. 31, no. 12, pp. 1504-1525, 2012. D. Zelazo, Franchi, A., Allgöwer, F., Bülthoff, H. H., and Robuffo Giordano, P., “Rigidity Maintenance Control for Multi-Robot Systems”, in 2012 Robotics: Science and Systems Conference, Sydney, Australia, 2012. A. Franchi, Secchi, C., Ryll, M., Bülthoff, H. H., and Robuffo Giordano, P., “Shared Control: Balancing Autonomy and Human Assistance with a Group of Quadrotor UAVs.”, IEEE Robotics and Automation Magazine, Special Issue on Aerial Robotics and the Quadrotor Platform, vol. 19, no. 3, pp. 57-68, 2012. C. Masone, Franchi, A., Bülthoff, H. H., and Robuffo Giordano, P., “Shared Trajectory Planning for Human-in-the-loop Navigation of Mobile Robots in Cluttered Environments”, 5th Int. Work. on Human-Friendly Robotics. Bruxelles, Belgium, 2012. J. Lächele, Franchi, A., Bülthoff, H. H., and Robuffo Giordano, P., “SwarmSimX: Real-time Simulation Environment for Multi-robot Systems”, in 3rd Int. Conf. on Simulation, Modeling, and Programming for Autonomous Robots, Tsukuba, Japan: , 2012. A. Franchi, Masone, C., and Robuffo Giordano, P., “A Synergetic High-level/Reactive Planning Framework with Application to Human-Assisted Navigation”, 2012 IEEE IROS Work. on Real-time Motion Planning: Online, Reactive, and in Real-time. Vilamoura, Portugal, 2012. M. Cognetti, Stegagno, P., Franchi, A., and Oriolo, G., “Two Measurement Scenarios for Anonymous Mutual Localization in Multi-UAV Systems”, in 2nd IFAC Workshop on Multivehicle Systems, Espoo, Finland, 2012. P. Robuffo Giordano, Franchi, A., Secchi, C., and Bülthoff, H. H., “Bilateral Teleoperation of Groups of UAVs with Decentralized Connectivity Maintenance”, in 2011 Robotics: Science and Systems Conference, Los Angeles, CA, 2011. A. Franchi, Masone, C., Bülthoff, H. H., and Robuffo Giordano, P., “Bilateral Teleoperation of Multiple UAVs with Decentralized Bearing-only Formation Control”, in 2011 IEEE/RSJ Int. Conf. on Intelligent Robots and Systems, San Francisco, CA, 2011, pp. 2215-2222. A. Franchi, “Decentralized Bilateral Aerial Teleoperation of Multiple UAVs - Part I: a Top-Down Perspective”, RSS 2011 Workshop on 3D Exploration, Mapping, and Surveillance with Aerial Robots. Los Angeles, CA, 2011. A. Franchi, Bülthoff, H. H., and Robuffo Giordano, P., “Distributed Online Leader Selection in the Bilateral Teleoperation of Multiple UAVs”, in 50th IEEE Conference on Decision and Control , Orlando, FL, 2011, pp. 3559-3565. H. I. Son, Kim, J., Chuang, L. L., Franchi, A., Robuffo Giordano, P., Lee, D., and Bülthoff, H. H., “An Evaluation of Haptic Cues on the Tele-Operator’s Perceptual Awareness of Multiple UAVs’ Environments”, in IEEE  World Haptics Conference, Istanbul, Turkey, 2011, pp. 149-154. P. Robuffo Giordano, Franchi, A., Secchi, C., and Bülthoff, H. H., “Experiments of Passivity-Based Bilateral Aerial Teleoperation of a Group of UAVs with Decentralized Velocity Synchronization”, in 2011 IEEE/RSJ Int. Conf. on Intelligent Robots and Systems, San Francisco, CA, 2011, pp. 163-170. D. Lee, Franchi, A., Robuffo Giordano, P., Son, H. I., and Bülthoff, H. H., “Haptic Teleoperation of Multiple Unmanned Aerial Vehicles over the Internet”, in 2011 IEEE Int. Conf. on Robotics and Automation, Shanghai, China, 2011, pp. 1341-1347. H. I. Son, Chuang, L. L., Franchi, A., Kim, J., Lee, D., Lee, S. - W., Bülthoff, H. H., and Robuffo Giordano, P., “Measuring an Operator's Maneuverability Performance in the Haptic Teleoperation of Multiple Robots”, in 2011 IEEE/RSJ Int. Conf. on Intelligent Robots and Systems, San Francisco, CA, 2011, pp. 3039-3046. P. Stegagno, Cognetti, M., Franchi, A., and Oriolo, G., “Mutual Localization using Anonymous Bearing Measurements”, in 2011 IEEE/RSJ Int. Conf. on Intelligent Robots and Systems, San Francisco, CA, 2011, pp. 469-474. A. Franchi, Robuffo Giordano, P., Secchi, C., Son, H. I., and Bülthoff, H. H., “A Passivity-Based Decentralized Approach for the Bilateral Teleoperation of a Group of UAVs with Switching Topology”, in 2011 IEEE Int. Conf. on Robotics and Automation, Shanghai, China, 2011, pp. 898-905. J. W. Durham, Franchi, A., and Bullo, F., “Distributed Pursuit-Evasion with Limited-Visibility Sensor Via Frontier-based Exploration”, in 2010 IEEE Int. Conf. on Robotics and Automation, Anchorage, AK, 2010, pp. 3562-3568. A. Franchi, Stegagno, P., Di Rocco, M., and Oriolo, G., “Distributed Target Localization and Encirclement with a Multi-robot System”, in 7th IFAC Symposium on Intelligent Autonomous Vehicles, Lecce, Italy, 2010. F. Pasqualetti, Franchi, A., and Bullo, F., “On Optimal Cooperative Patrolling”, in 49th IEEE Conference on Decision and Control, Atlanta, GA, USA, 2010, pp. 7153-7158. A. Franchi, Oriolo, G., and Stegagno, P., “Probabilistic Mutual Localization in Multi-agent Systems from Anonymous Position Measures”, in 49th IEEE Conference on Decision and Control, Atlanta, GA, USA, 2010, pp. 6534-6540. A. Franchi, Oriolo, G., and Stegagno, P., “On the Solvability of the Mutual Localization Problem with Anonymous Position Measures”, in 2010 IEEE Int. Conf. on Robotics and Automation, Anchorage, AK, 2010, pp. 3193-3199. P. Robuffo Giordano, Franchi, A., Son, H. I., Secchi, C., Lee, D., and Bülthoff, H. H., “Towards Bilateral Teleoperation of Multi-Robot Systems”, 3rd Int. Work. on Human-Friendly Robotics. Tuebingen, Germany, 2010. A. Franchi, “Decentralized Methods for Cooperative Task Execution in Multi-robot Systems”, "La Sapienza" University of Rome, 2009. A. Franchi, Oriolo, G., and Stegagno, P., “Mutual Localization in a Multi-Robot System with Anonymous Relative Position Measures”, Department of Computer and System Sciences Antonio Ruberti, 2009. A. Franchi, Oriolo, G., and Stegagno, P., “Mutual Localization in a Multi-Robot System with Anonymous Relative Position Measures”, in 2009 IEEE/RSJ Int. Conf. on Intelligent Robots and Systems, St. Louis, MO, 2009, pp. 3974-3980. A. Franchi, Freda, L., Oriolo, G., and Vendittelli, M., “The Sensor-based Random Graph Method for Cooperative Robot Exploration”, IEEE/ASME Transaction on Mechatronics, vol. 14, no. 2, pp. 163-175, 2009. A. Franchi, Freda, L., Marchionni, L., Oriolo, G., and Vendittelli, M., “Decentralized cooperative exploration: Implementation and experiments”, in 10th Int. Conf. on Intelligent Autonomous Systems, Baden-Baden, Germany, 2008, pp. 348-355. A. Franchi, Freda, L., Oriolo, G., and Vendittelli, M., “A decentralized strategy for cooperative robot exploration”, in ACM International Conference Proceeding Series, Proceedings of the 1st international conference on Robot communication and coordination, Athens, Greece, 2007, vol. 318. A. Franchi, Freda, L., Oriolo, G., and Vendittelli, M., “A Randomized Strategy for Cooperative Robot Exploration”, in 2007 IEEE Int. Conf. on Robotics and Automation, Rome, Italy, 2007, pp. 768-774.